Ha, next Friday will not be October, so here is a Halloween Friday Photo as close to Halloween as I can get since Halloween is next Wednesday. 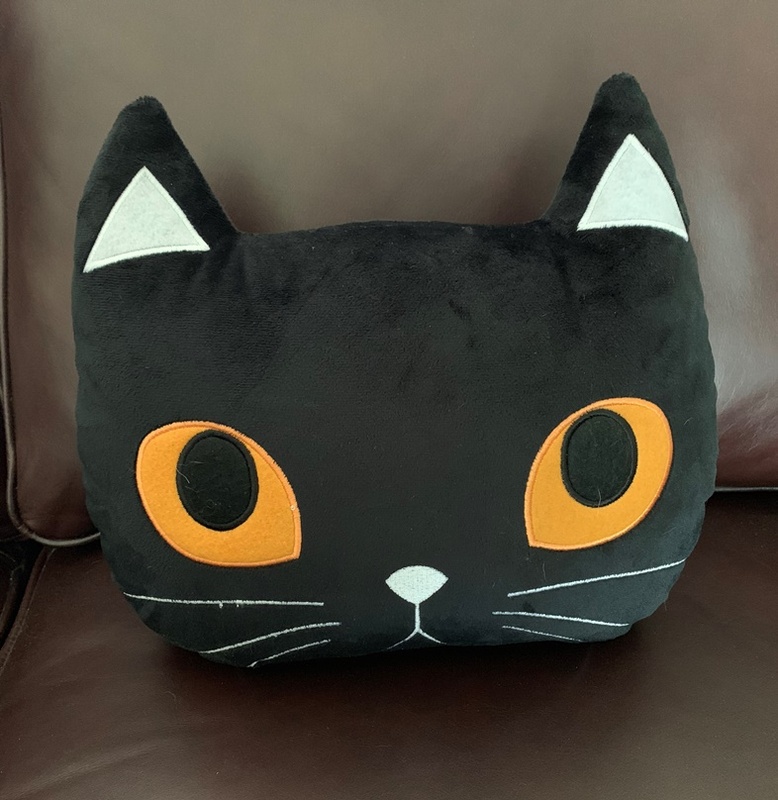 This is a black kitty pillow. It was so cute I wanted a picture. I didn’t even ask the owner if I could take a picture for posting. I am pretty sure she wouldn’t mind! Ooooo! Only TWO months left to fill up the Goodie Jar. It is never to late to note the good things so if you haven’t started yet, why not start NOW!?!?! I have a few good things to put into my jar today. I had a fabulous conversation with a potential Nia student. I talk to a lot of potential participants, some actually do end up attending one of my Nia classes and some do not, but I have always had wonderful conversations. While I would love to have everyone I talk to come to one of my Nia classes and I would love to meet them, I still feel fortunate to have been able to talk to them on the phone. I love sharing about Nia and listening to their stories. So many are inspirational. Also, I received a wonderful e-mail. The subject alone made me so happy. (“Nia rocks my world!”) How could it not? The rest of the e-mail made my face hurt (from SMILING)!!!!!!! I loved it so much, I printed it out and it is going in the goodie jar! And, as some of you may know, our cat has Inflammatory Bowel Disease (IBD) which is a chronic condition. Basically it means that the intestines are not working properly so the body does not absorb the required nutrients. When the body does not absorb what it needs it does not function the way it should. And when the intestines are not healthy there are other issues. So it is a matter of controlling symptoms and getting the body to a comfortable and a close-to-normal state as possible. It has been about three months since we started treating this and today is a good day. I think – as with many things – there will be days where she doesn’t feel as good as others. I think that is just the way it will be. But today we are half-way through our fifth day without vomit. When I wrote my post Spot Update we were almost up to a three day vomit-free period, but that was as long as we got. Now we are on our fifth day. That is really huge. Even if she throws up now we still made it almost FIVE DAYS! I am sure she is as happy about it as I am! To me four and half days vomit free is a darn good thing. See there really is no rule as to what you can put in your jar. THIS is a good thing for me. THIS makes me happy. When I read about it on December 31, 2013, I will be happy. What are you putting in your goodie jar? Any good things happen yesterday on Halloween? I teach my Nia classes in a studio in San Jose that is next to a pet store. The groomer that works there usually gets there before the shop is open so she sits outside in front waiting. Often she has a puppy or a dog that she has rescued and is trying to adopt out. She seems to be able to rescue them and it works out that she can find someone to adopt them pretty quick. This time she had her own animals. I heard them yelping and realized they were puppies so I peeked out. 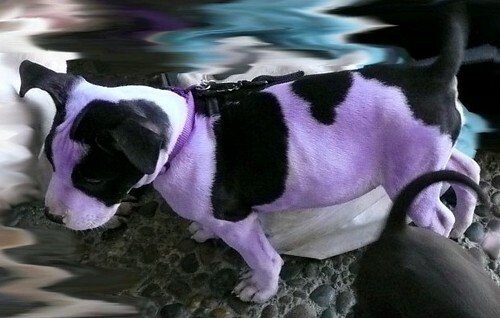 Imagine my surprise when I saw a purple puppy with black patches. Her sister was black and pink. They were jumping and yelping and vying for attention. 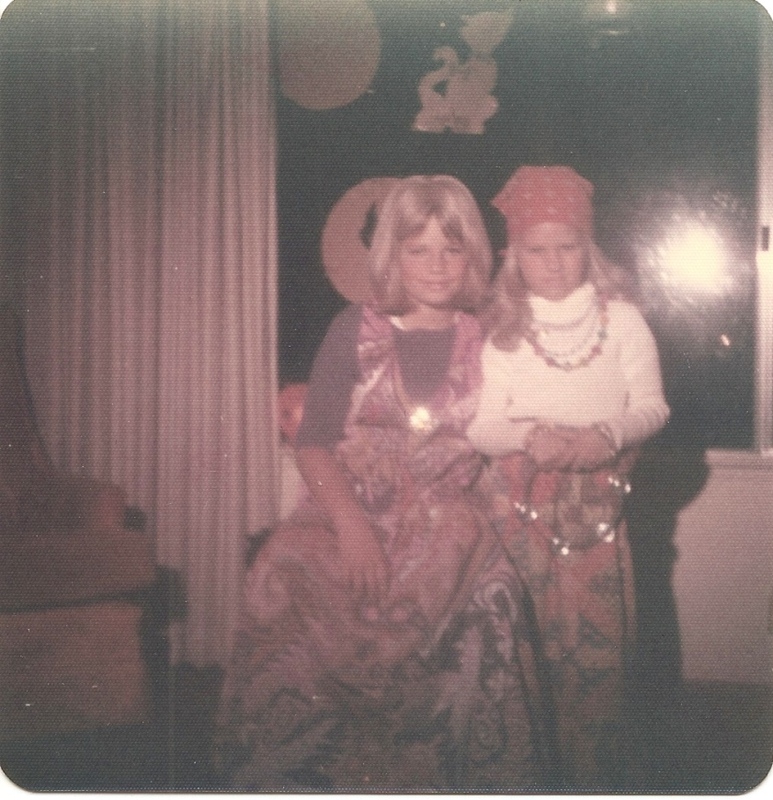 They were obviously cute little girls, but with their bright colors it made them even more adorable. Keep in mind these animals are puppies and you know how puppies are. It was a miracle that they were still long enough to get a shot, but having them be in a particular spot for correct lighting was not possible. In fact I don’t think the little one was still at all. 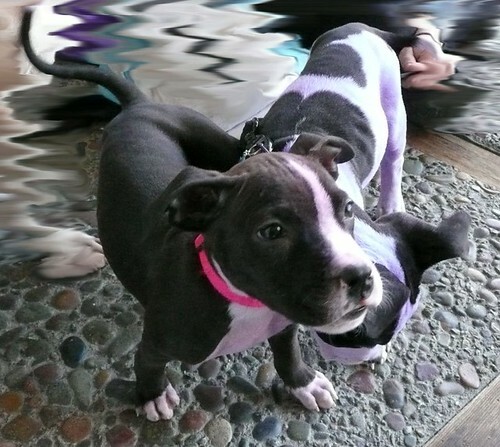 I did not retouch the puppies, but I did blur some of the background. 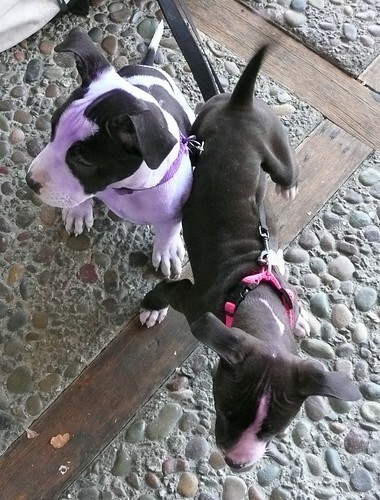 The sun was really bright when it was shining on the purple puppy. The sun almost washed out the purple. It definitely made her color seem less bright. 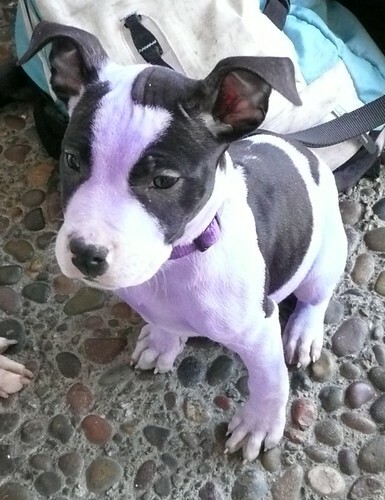 But she was pretty purple. And her sister had a pink muzzle, chest, and pink feet. It was really cute. They were really cute. Full of energy. 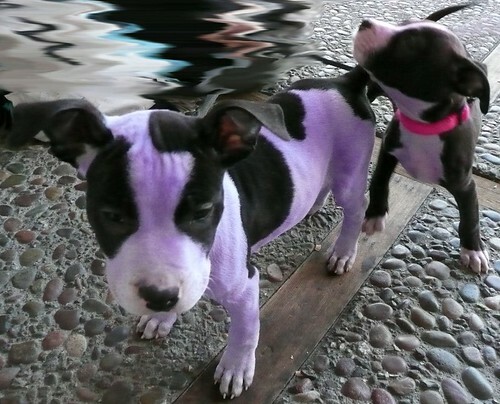 Since it is Halloween, I thought it would be cute to post pictures of Purple and Pink puppies!